We answered a plea for chivalry, to play a hero’s game. No, we are not the heroes, we’re still fighting to survive. While across the land a marching band echoes empty lives. And too many mothers’ sons were lost in vain, In the pouring rain. Lost in Vietnam, forever gone; Forever gone – in Vietnam. There’s a black granite “V” for history, to hide a nation’s shame. The pride that died we try to hide in the shadow of our fame. That he was lost in Vietnam, forever gone. Forever gone – in Vietnam. And as the gates of Heaven opened, they were all welcomed home. And their names were written forever on that Wall – that Wall of Stone. 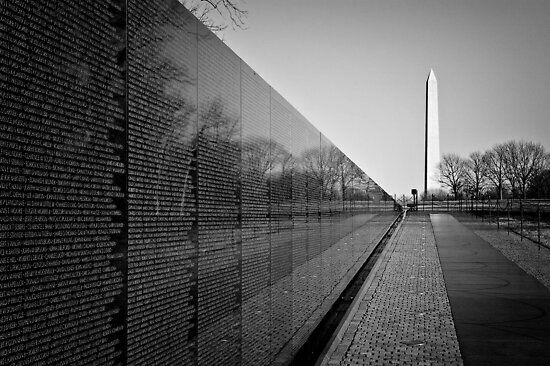 Their names are written forever on that Wall of Stone.